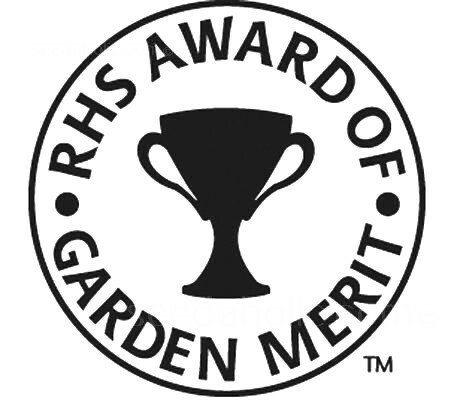 This perennial relative of the sweet pea is justifiably popular for its masses of pure white flowers which bloom over a long period throughout the summer month. Despite its lack of scent, it has one of the finest cut flowers and is always a colourful addition to the garden. Introduced before 1635, it became popular in gardens in the early 1900s, often grown over a floral cage - very fashionable in Victorian England! Easy to grow. Drought, salt and wind tolerant, it requires little care and will quickly cover arbors, trellis or fences with perfect foliage and tresses of flowers all summer. 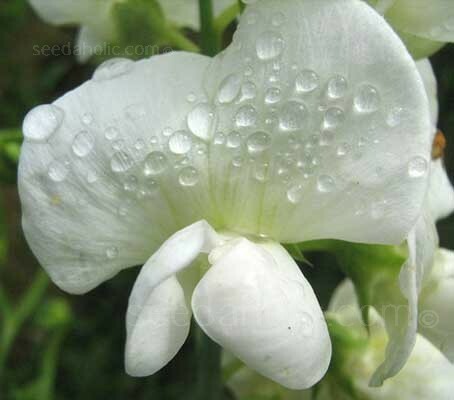 Germination of sweet pea seed is often quicker and more uniform if the seeds are soaked in warm water for 24 hours immediately prior to sowing. This also enables you to identify any seeds with hard coats, which fail to swell during this period. These should have the seedcoat nicked with a small file to enable them to take up water. Seeds can be started indoors in spring, 6 to 8 weeks before transplanting outdoors. Sow into individual 7cm (3”) pots, using good seed compost. A temperature of 18 to 20*C will give rapid, even germination. As soon as the seedlings have emerged, they need to be grown as cool, and with as much light, as possible. Pinch out growing point once the second pair of leaves has opened. Sweet peas can be sown direct into the open ground where they are to flower in spring, as early as the soil can be worked. Sow 7cm (3in) apart, at 5cm (2in) deep and thin the resulting plants to an average of 15cm (6in) apart. They will take 20 to 30 days to emerge. Slugs and mice can be a real problem on a direct sown crop, so take suitable precautions before you sow. Perennial Sweet Peas prefer full sun although will tolerate a little morning or late afternoon shade. In full shade flower production will drop dramatically. The plant survives but all you wind up with is green foliage. It will tolerate dry soil once established; on clay soils it does tend to disappear as the winter-wet rots it off. It will thrive in full sun and a rich soil. Incorporate lots of well-rotted organic matter in the planting hole. Pinch out the shoot tips to encourage bushy growth and tie in new shoots to a support. Young seedlings can be prone to disease if over watered, but once the crop is in full growth, a copious supply of water is needed. A well prepared site will pay dividends by having considerable reserves of available moisture. It is essential to encourage early establishment and a strong root system if high quality flowers are to be achieved. Balanced fertilisers are safest, particularly tomato feed. Never apply heavy dressings of fertiliser to weakly growing plants - invalids need gentle coaxing back to health. Foliar feeding can be useful for plants with root problems, but frequent sprays of very dilute fertiliser will be needed to have a significant effect. Remove faded flowers regularly. Tie in new shoots to a support. Once established they do not like to be dug up & transplanted. Cut back the plant to ground level in autumn. Cottage/Informal Garden, Cut Flower Arranging, Flowers Borders and Beds or Patio/Container Plants. Fences, Trellis and screens. Helps fix nitrogen in the soil, improving very poor soil if planted temporarily. Lathyrus latifolius, commonly known as the Everlasting Pea or Perennial Pea, is native to most of southern Europe but has been naturalised in the UK. Lathyrus is derived from the Greek lathyros, meaning ‘pea’ or ‘pulse’, with latifolius being derived from the Latin latus meaning ‘wide’ and folium meaning ‘leaf’.